All week the hint of it hung in the air, or at least on the airwaves. “Snow expected on Friday.” “Winter weather headed this way,” broadcasters claimed. Yeah right. DC had been pummeled; Dallas was buried, but snow in Charleston is like sunshine in Seattle. Rare, unlikely, a tease. Friday was brisk, hovering in the 40s, and slightly gray, and I was brisk and gray with it — skeptical, wearing my less-than-attractive cynicism like an itchy wool scarf around my neck. When I got a call that school would close an hour early, before it even drizzled, I rolled my eyes. Oh how nice to be wrong. How lovely to have my snarky disbelief obliterated by frozen flakes of crystal manna. The snow began around 8 p.m.; by 8:30 our roof was covered. By 9 my nine year old was ecstatic, wet, cold, red-cheeked, wired. She played outside till 11 p.m., challenging our 60+year old neighbor, a staid lawyer by day, to an all-out snow ball fight. He’d launch one and holler “Incoming…” like he was 12 again. I forgot how gorgeous a new snowfall is, how the night sky turns florescent, how branches bow down under weight and beauty. How hallowed it is to walk along silent streets, feeling both frisky and snug. How amazingly the world transforms. And how fleeting it is, which, too, is its magic. Our first real snow in 10 years is all but gone now, but I am grateful for this early white valentine. For winter’s surprise gift, a reminder that things can change in the blink of snow-damp eyelash, and we weather it with our boots and gloves, lying down, making angels. ~ by Stephanie on 02/13/2010. It is wonderful, isn’t it! We in Virginia have had three big snows and I have relished every minute. It slows the head, the heart and our lives. Perhaps we all needed this reminder of God’s surprises in a world that has far too many troubles. Carpe diem – throw that snowball!! How wonderful for you and your girls! And thank you for painting such a beautiful picture of something that I admit to not caring one whit about. I almost envied you there, a second! 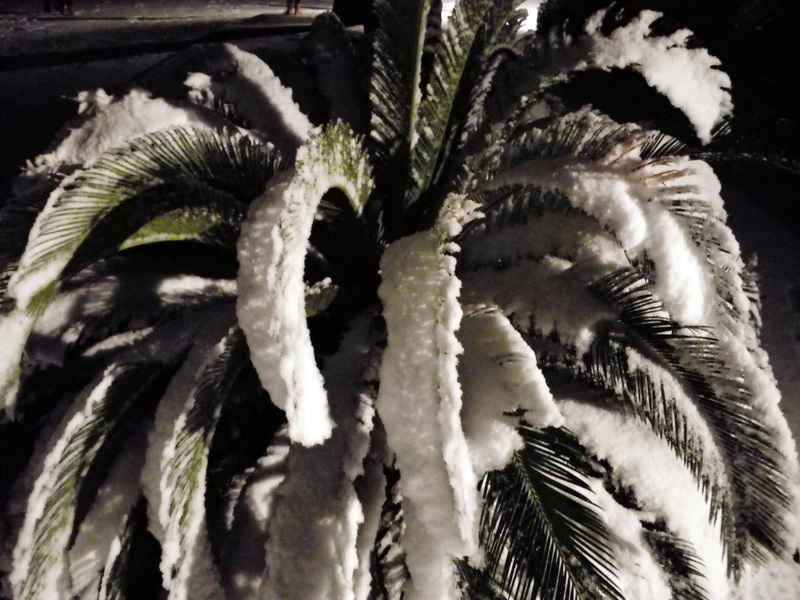 Wow, I love that palm in snow. It too is frisky and snug. Reminds me of the albino peacock I love at the petting zoo – unpettable though it is. A rare beauty. As is your ALS journal.